He could've done it better - and so can you. On my way home from dance last week, at the crosswalk on 5th Ave and 9th Street, I noticed a guy walking slowly in front of me. He was weaving a little as people do when they’re texting, except he was looking down at a piece of paper and then back up at the street sign. He turned around, right in my path, and stopped me just like I knew he would. In New York, people always stop you for directions when you’re wearing workout clothes. It makes sense. If you’re on your way to or from a workout, you’re probably a local. As a matter of fact, I did. We were right by it. “There’s one I’ve seen giving out food right over there,” I said pointing in the direction of the big, beautiful church on 5th. It’s an architectural landmark on my corner. “Yes, exactly.” I was proud for knowing my ‘hood. And my churches. And my food banks! It made me feel pro-social just to know where they are. ​I should volunteer, ​I thought. What about the Farmer’s Market at Union Square, I suggested. It was late afternoon, right when they might be getting rid of unsold produce. This guy had done his homework. I took out my wallet. Of course, all I had were 20s, which made me feel rich and guilty in itself. I’d been taking mental notes on his missing teeth and his junkie bone structure and wondered if this was all a “caper” — that’s what they called these cons on The Wire, capers — to get drug money. But that thought made me feel even more West-Village-white-lady-in-lycra rich and guilty, so I pulled out a 20 and handed it to him, thinking, I’ll be fine without the 20. Even if there are no kids and it’s just for his own food. Or even if it’s just for drugs. You do what you’ve got to do. But I hope it’s for food for his kids. I felt part like a decent person, part like a possible fool but so what, and part like a tool for being so self-congratulatory about giving away 20 bucks. Five days later, I’m on my way to dance class, walking a few blocks east on Broadway. I look right at him with my best, “Really?” face. He makes a U and goes the other way. Never mind. I knew it! This guy hangs out near churches, stops people who’ll point him to those churches and feel good that they at least tried to help. 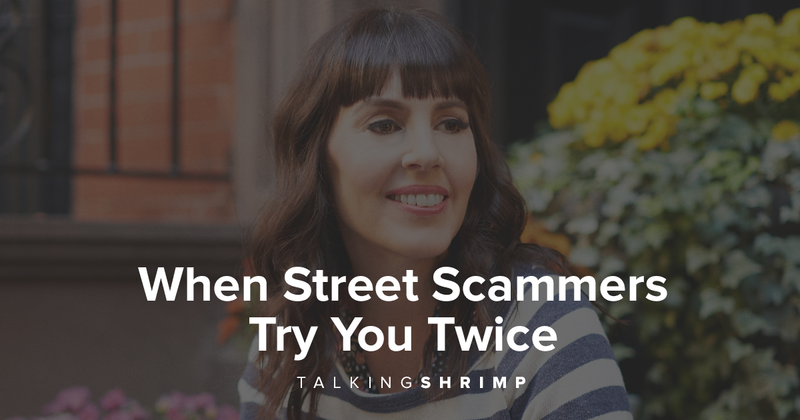 I already knew it might be a scam — the premise of it, anyway: that he’s been trying all these places, spent all day crossing them off his list — and so what if it is, yadda yadda, But now that I knew for sure I’d been taken, I felt like a jerk. Mostly because he didn’t recognize me. All he saw was a potential sucker in workout clothes. 1) Make people feel helpful. This guy’s ruse is smart. Not only does it build trust by making it look like he’s done all this boots-on-the-ground research; it gets people wanting to give him money without him even asking for money. How? He makes them feel involved and helpful. When they point him to a church, and give him suggestions, it confirms their belief, “I’m a helpful person.” And then they’re inspired to be more helpful, by opening the ol’ wallet. Ask your audience for things that are easy to give: advice, input, encouragement, sharing a post, or giving to a charity you like. 2) Always sell us what we already bought. Here’s the one thing this guy’s strategy is missing, that could’ve made it so much better. You know how after you buy a pair of shoes, ads keep showing up for those same shoes on Facebook? And you click on them even though you already bought, just to remember how great they are? Or, even after a vacation, when you see the hotel you stayed in featured in Conde Nast Traveler and it makes you think, “That was the best vacation ever”? We want confirmation that we love what we paid for. It makes us buy more. If this guy had recognized me and said, “Hey, it’s you! Thanks so much for helping out the other day, it made a big difference,” I probably would’ve thought, “Best 20 bucks I’ve spent” and pulled out my wallet again. Make people feel remembered. Remind them how smart their purchase from you was. Even with your opt-in freebies, you should send an email to tell them why that pdf or video or discount they signed up for is so useful and effective. They’ll be more likely to open it up and use it and value it. 3) They always try me twice. This same week, at the Farmer’s Market, one of those Lubavich (ultra-religious, outreach-y ) Hassidic Jewish women in a wig and frumpy-length black clothes wandered up to me when I was tasting jam samples and said, “Excuse me, are you Jewish?” I said no. I am, but you never tell these people (they’re from a syes, or they try to pull you over to their van and convince you to be way, way, way MORE Jewish. Find God on the High Holidays, wear a wig, have 10 children! No thanks. I find God every day, in free jam samples — especially the strawberry rhubarb (and yes, I do occasionally buy, and I have a full punch card to prove it). She wandered away looking for someone else. Not three minutes later, a few stands down where I was buying tomatoes, she came up to me again. “Excuse me, are you Jewish?” I gave her that face: Really? How is this a business lesson? Only for me. There’s a pattern here. I have a forgettable face, which is liberating because it means that when I go back to the same stand for more samples, they see me as a whole new person — not some schnorrer who’s trying to make a whole lunch of free cut-up nectarine pieces, free fried shishito peppers, and free whatever-else-you-can-stab-with-a -toothpick. More samples for me! What’s your takeaway? Would you feel scammed by this guy? Put lesson #1 into effect and prove to yourself that you’re an awesome person, by leaving a comment!